American actor, best remembered for roles in films such as The Wayward Bus, My Blue Heaven, The Wings of Eagles, Meet Me in Las Vegas, The Pride of St. Louis, Mother Wore Tights and Call Me Mister and What Price Glory. Once quoted saying "I'm six feet four inches and Betty was only five feet two and yet it looked fine when we danced together." I'm leaning on more 190 I think. @Rob, can you add My Blue Heaven? Yes, he certainly looked around this but if Peck was just 6'2.5 then you can't rule it out for this guy either! A very obvious 6'3 really, looked similar sort of height to Cooper and Stewart in Meet Me in Las Vegas. 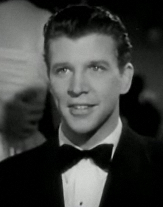 "Dan Dailey's height is 6ft 2½in (189.2cm)"
He looked eye to eye with James Stewart in The mortal storm. And very similar to John Wayne in The wings of the eagles. !`91 sounds fair for him. Dailey was consistently 6' 3" in his movies in the 1940's and 50's, similar to Gregory Peck. By the time of his two TV series, "The Governor and JJ" and "Faraday and Company", he may have been heading towards a strong 6' 2". I think we can rule out 6 ft 4!! Well he was pretty leggy, similar sort of legs to Peck and Stewart, perhaps he was the full 6'3", in some scenes I thought he looked more 6'2" range though. There was one scene in which he was walking with Dolores Michaels I think it was and he did look the full 6'3". Mmm maybe he was. I'd have put him at similar to Joel McCrea though. Rob can you add a photo and The Wayward Bus, The Wings of Eagles, Meet Me in Las Vegas, The Pride of St. Louis, Mother Wore Tights and Call Me Mister? Are you sure on a big 191cm 6'3? Doesn't look it to me in The Wayward Bus. He looked about an inch under John Wayne. I've just watched "Mortal Storm" as referred to by Bob H. Early in the scene mentioned, Dailey seems a bit shorter than Stewart, but it must have been the camera angle used. A few minutes later Dailey and Stewart have a face to face confrontation, only inches apart, lasting about a minute. They are exactly the same height, eye to eye. Proof positive that Dailey was indeed 6'3". Dailey was a legit 6'3" in his movie work in the 1950's, as seen with close to 6' Hugh O'Brian in "There's No Business like Showbusiness", and 6'1" Jay C Flippen in "Its Always Fair Weather". Similarly with John Wayne in "The Wings of Eagles". Dailey was 6`3, no doubt about it. Watch as Larry says The wings of eagles or Mortal storm to see him next to Wayne and James Stewart. Basically the same height. Watch THE WINGS OF EAGLES with John Wayne and Ward Bond. Mr. Daily surely looked 6'2.5 - 6'3" in that movie and in his other movies as well.